Conflicts in the labour market are detrimental to economic growth and welfare. Sweden was among the countries with the highest incidents of industrial disputes in the 1920s, but experienced declining levels from the 1930s onward. Using Swedish data from 1919 to 1938, this column shows that towns with both powerful unions and strong Social Democratic presence experienced labour market peace. The results point toward the importance of labour market peace for strategic political reasons, rather than to politicians offering tangible concessions via municipal governmental power. There are large discrepancies in the extent of social conflicts across countries in today’s world. One key area of contention is between workers and employers. In terms of strike activity, Southern Europe, for example, sees much more social strife than the Scandinavian countries(European Trade Union Institute 2016). Why is it that some societies experience a high rate of conflict, while others are marked by fruitful cooperation between the parties in the labour market? This question has interested scholars for decades. Some assumed that industrial conflicts would naturally ‘wither away’ because industrialisation would set societies on a shared path towards the institutionalisation of class conflict (Ross and Hartman 1960). This idea has been criticised, most influentially by the so-called power resource theory articulated by sociologist Walter Korpi and others (Korpi and Shalev 1979, Korpi 2006). The Swedish case played a central role in the original formulation of this theory. Sweden was among the countries with the highest incidents of industrial disputes in the 1920s, but experienced declining levels from the 1930s onward and, by the early postwar period, strikes had almost disappeared. This coincided with growing union strength and the ascent of the Social Democratic Party in national politics. This turn of events led Korpi to theorise that power resources in the hands of the labour movement, such as unions and labour-affiliated parties, play a critical role in explaining comparative levels of strike activity. When the labour movement is powerful, it can shift the conflict with capital from the labour market to the political arena, thereby avoiding costly strikes. However, firm evidence of the connection between labour's power resources and strike activity is still lacking in the literature. 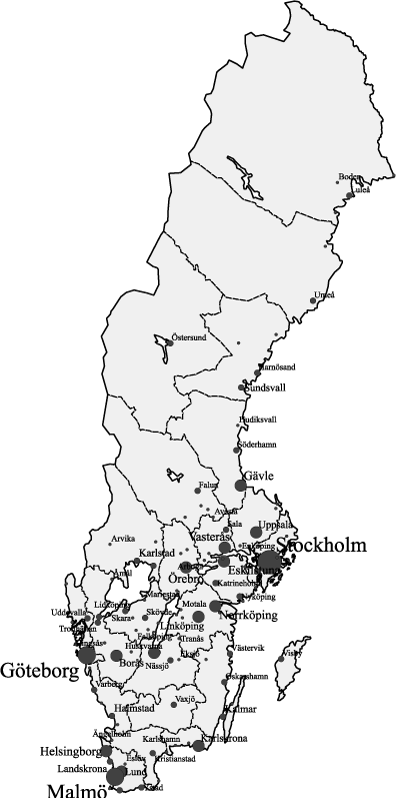 In order to investigate the existence of a causal link between power resources and peace in the labour market, we analyse the impact of union presence and the left's political influence in disputes using a panel of 103 Swedish towns between 1919 and 1938 (Molinder et al. 2018). This period is central to understanding how the country moved from widespread conflict to labour peace. The map in Figure 1 shows the location of each town in the dataset. There are two reasons for analysing this issue at a local level. First, in the literature, the focus is often on national legislative arenas but, during the interwar period, most strikes were local in nature and many decisions affecting the welfare of capital and labour were decided by municipalities. 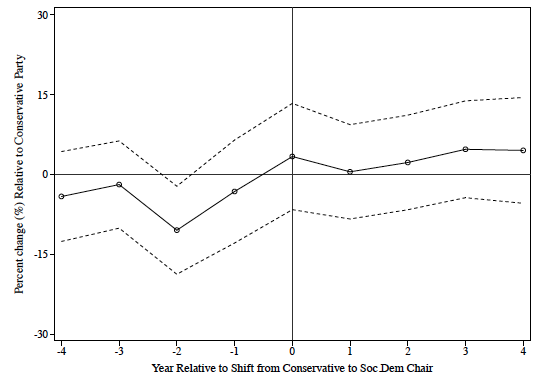 Second, the panel dataset allows us to test for a connection between union strength, political power, and strikes using a more extensive set of observations than previous studies which focused solely on cross-country patterns. 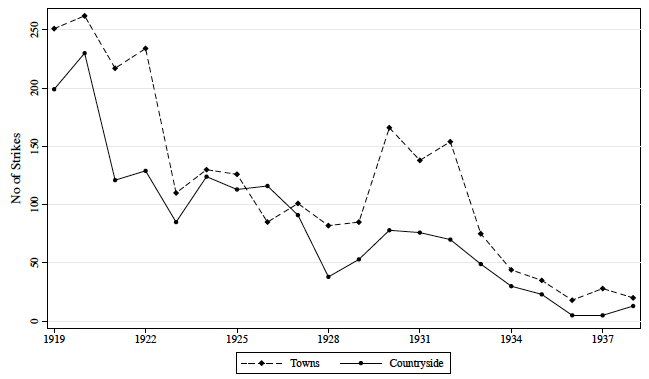 Figure 2 shows the number of strikes between 1919 and 1938, divided between towns and the countryside. The figure highlights the falling occurrence of industrial disputes over time. In the early 1920s, there were more than 200 strikes per year in urban areas but by the late 1930s, this number had fallen to below 25. The trends are similar for towns and countryside alike. Union strength continued to grow throughout this period. In our dataset, the median town experienced a ten percentage point increase in the fraction of the population organised in a union. By 1938, nationally, almost half of the labour force was organised, and this was the highest rate of union density in any country with comparable data. The political influence of the labour movement also grew. Figure 3 shows the share of town councils led by a Social Democratic politician compared with political rivals – the Conservative Party and the two liberal parties. 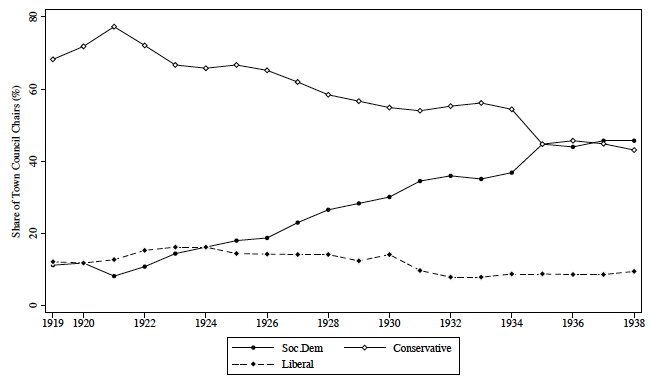 The share of councils controlled by the Social Democrats grew from around 20% to above 45% by 1938. The increase came at the cost of a falling share for the Conservatives with a tight link to employers. To analyse the influence of labour's growing power resources on local labour conflicts, we estimated the effect of the fraction of the population organised in a union and the political affiliation of the municipal council chair on the number of strikes, normalised by population. As an alternative measure of political influence, we additionally used the share of seats held by any of the parties on the left in the local council. 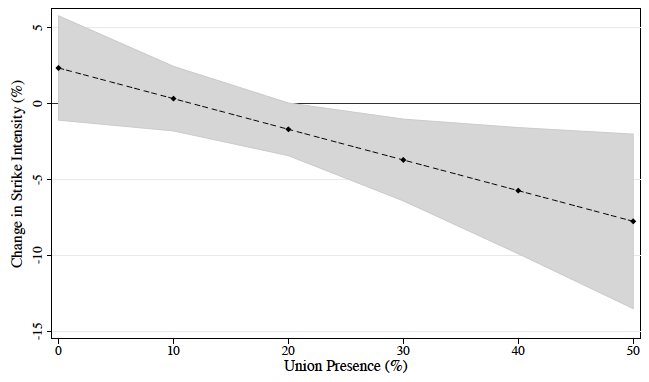 To account for synergies between the presence of unions and the left's political power, we also used a variable accounting for possible interactions between the two indicators, in addition to entering them individually in the regressions. We found that local union strength had a strong, positive, and statistically significant effect on the number of strikes. An increase in union presence by ten percentage points – the median in the sample – would imply an increment in strike intensity by more than 3% per year. However, a political shift from the Conservative Party to the Social Democrats had a notable muting impact on the number of strikes, but only in towns where unions had a strong presence. To visualise this result, Figure 4 plots the marginal effect of such a political shift at different levels of union presence. Did workers receive tangible benefits? While we found evidence for the influence of labour's power resources on local strike activity, we also wished to determine the mechanisms that underpin the relationship. According to the power resource theory, a reduction in strikes is the result of unions’ ability to extract tangible concessions from employers through the political process instead of engaging in costly labour disputes. One of the critical ways in which the political process distributes resources is through public spending. 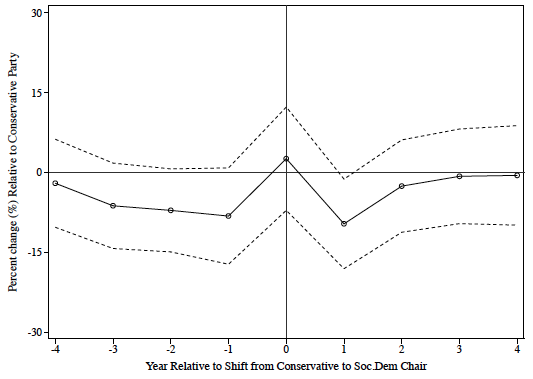 To evaluate the accuracy of this claim, we studied the change in local government spending after a shift from the Conservative Party to the Social Democrats in three areas: public schooling, health care, and poverty relief. Figure 5 shows what happened around the time of such a shift. Interestingly, we did not see any significant change in spending per capita in any of these areas after a political takeover by the Social Democrats. An alternative mechanism linking politics to labour conflicts is that left-wing parties need peace in the labour market to gain support from broader segments of society. If middle-class voters associate social democracy with labour militancy, they may cast their votes for bourgeoisie parties instead. At the national level, the Social Democratic Party showed an apparent tendency toward targeting broader groups in elections. Part of this development also involved the educational campaigns set up by the leadership of the Swedish Confederation of Labour to shape the identity of Social Democratic workers and set them apart from more radical strands of the labour movement. 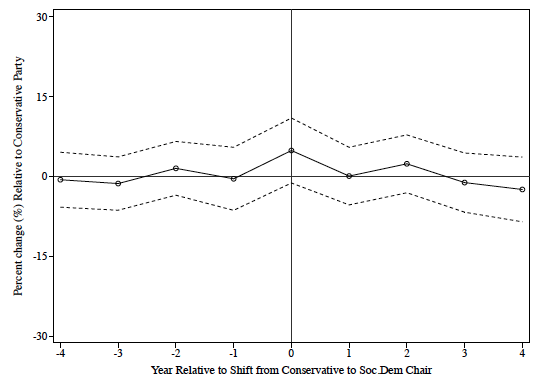 When union members saw their peers chosen for local political office, they may have shifted their strategy from direct conflict to political bargaining for strategic reasons. We collected information on the background of the Social Democratic politicians who appear as municipal council chairs in our dataset and we found that more than 70% of the Social Democratic chairmen had a working-class background. Among those, almost 80% were union members. Many had also held leadership positions within the union movement. Interestingly, we also found that the share of council chairs with a background in the unions was highest in those towns where unions were most active, which could explain why the moderating impact on industrial conflicts of a Social Democratic takeover was only present in places with high union presence. Our study provides a first test of power resource theory at sub-national level. We find evidence of a causal link from union strength and Social Democratic power to labour market peace. However, the mechanism is not politicians offering tangible concessions via municipal governmental power. Rather, the results point toward the importance of labour market peace for strategic political reasons. This was easier to achieve with a municipal chair belonging to the union movement. At a more general level, our results underscore the importance of institutions which influence the supply and education of politicians from different societal backgrounds. The existence of channels through which politicians can be recruited from organisations in the labour market, while at the same time ensuring that they have sufficient skills and pragmatism to intermediate in labour relations, might be a crucial ingredient for achieving labour market peace. European Trade Union Institute (2016), “Strikes – map of Europe”. Korpi, W (2006), “Power resources and employer-centered approaches in explanations of welfare states and varieties of capitalism: Protagonists, consenters, and antagonists”, World Politics 58(2): 167-206. Korpi, W and M Shalev (1979), “Strikes, industrial relations and class conflict in capitalist societies”, British Journal of Sociology 30(2): 164-187. Molinder, J, K Enflo and T Karlsson (2018) “The power resource theory revisited: What explains the decline in industrial conflicts in Sweden?”, CEPR Discussion Paper 13130. Ross, A M and P T Hartman (1960), Changing patterns of industrial conflict, New York: Wiley.